It’s the beginning of a new year, aka resolution season. One of the top resolutions, of course, is to get into shape, drop pounds, tone up, etc. But with temperatures so low they’d make a grown man cry, it’s hard to find the motivation to get those workout plans into gear. It’s always easier for me to workout when I have some fly gear and motivating electronics/apps. So I thought I’d share a few items that may get you excited enough to brave the insane cold for the sake of getting your workout on. 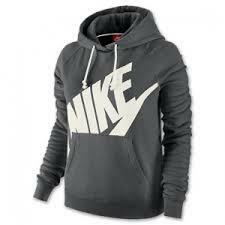 To add to the motivation, I’ll also be giving away the Nike sweatshirt above (in medium) to help you along your way. So take a look at the slideshow and read the instructions below on how to qualify to win the sweatshirt. Happy Resolution Season and Good Luck!! To qualify to win this sweatshirt you must: follow GladiatHers on twitter, like GladiatHers on Facebook and like or retweet a post. The winner will be randomly selected and announced a week from today on Jan. 14th. Gloves. Ear Warmers. Vest. Tights. Shoes. App.